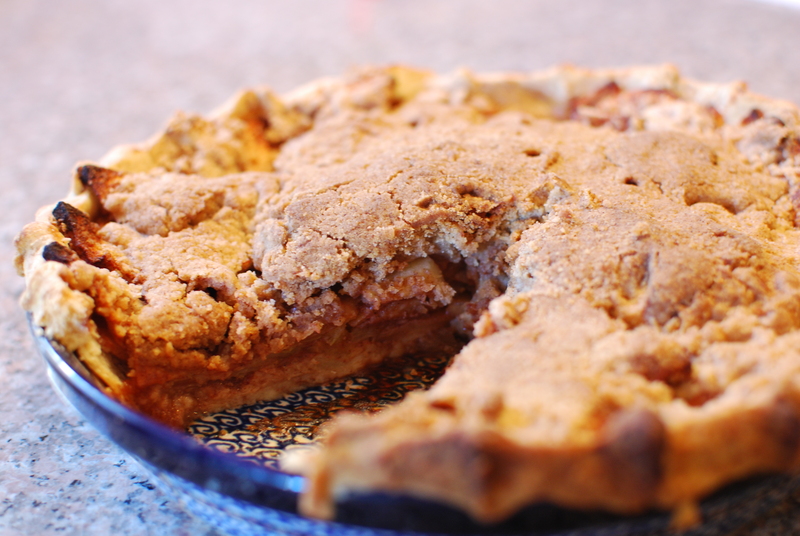 If you like apple pie and if you like crumb topping, you’ll love this apple crumb pie! This pie will have its place at our Thanksgiving feasts. Make the pie crust according to directions, roll it out into a 9-inch pie plate and refrigerate for at least 30 minutes before filling with the apples. Preheat the oven to 375*. Peel, core and slice all the apples to about 1/4-inch thick. It doesn’t have to be exact – just try to get them all about the same thickness so the apples cook evenly. Toss the apples in a bowl with the lemon juice, sugar, and cinnamon. Add the apple mixture to the chilled crust. In a medium bowl, whisk together the flour, sugar, and cinnamon. Add the butter pieces and cut in with a fork, your fingers or a pastry blender until the mixture is coarsely combined and makes a streusel-like consistency. Lightly press the crumb mixture on top of the apples. Place the pie on a foil-lined baking sheet and bake for 1 hour and 30 minutes until the apples are tender and the crust is golden brown. If the crust edges are getting too dark during the last 30 minutes of baking, you can cover them with foil for the remainder of baking. Serve warm or at room temperature. This pie is delicious with a bit of whipped cream or vanilla ice cream.